The oxides of sulphur (SOx; SO2 + SO3) emissions are a direct result of the sulphur content of the fuel oil. During the combustion process this fuel-bound sulphur is rapidly oxidised to sulphur dioxide (SO2). A small fraction of the SO2, some 3-5% may be further oxidised to sulphur trioxide (SO3) within the combustion chamber and exhaust duct. The actual amount depends on the combustion temperature and pressure, excess air and fuel sulphur content. The process is promoted by the presence of iron and vanadium oxides which act as catalysts. In the exhaust gases, a reaction occurs between the SO3 and water vapour to form sulphuric acid (H2SO4). Above 450°C the H2SO4 will be almost completely disassociated, but as the temperature decreases an increasing proportion will be present as an acid vapour. As this vapour cools and is exposed to relatively cool surfaces, it condenses at the prevailing dew point. 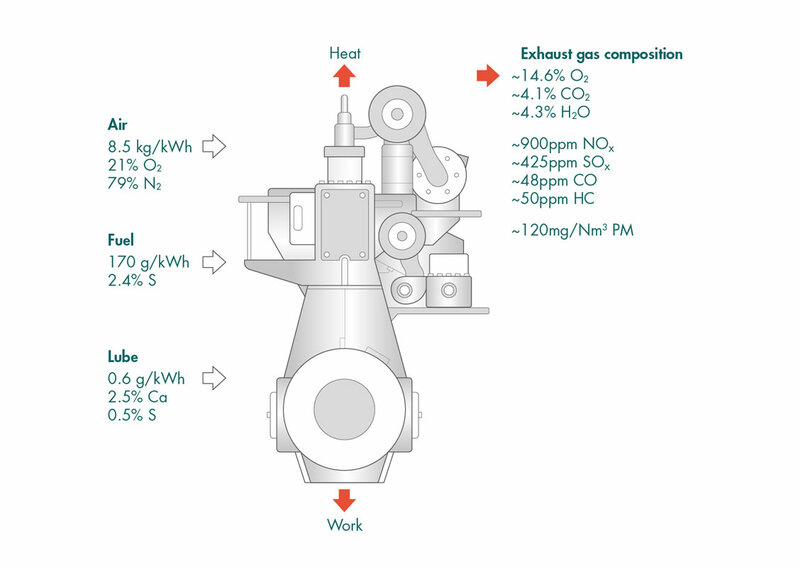 As the exhaust gas stream cools following discharge from the combustion chamber much of the SO2 that further oxidises to SO3 in the exhaust stream will also be included in the particulate fraction. (Particulate matter is a complex mixture of mainly soot, i.e. virtually elemental carbon, fuel oil ash containing heavy metals such as vanadium and nickel, sulphates and associated water, nitrates, carbonates and a variety of non, or partially combusted hydrocarbon components, derived from the fuel oil and engine lubricant). 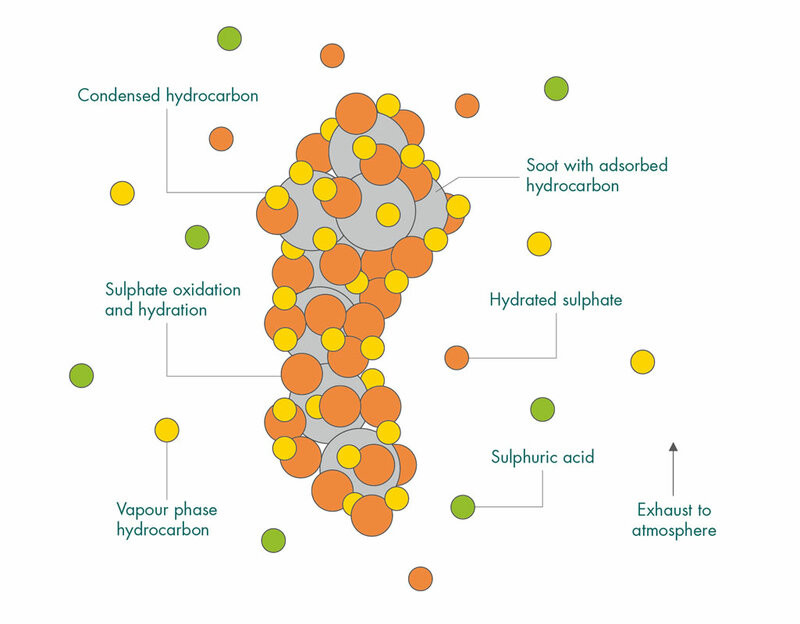 In summary a proportion of the SO3 formed during the cooling of the exhaust gas will react with some of the water vapour present to exist as sulphuric acid and will thereafter absorb water vapour. The remainder will undergo either gas phase oxidation and condense as sub-micronic droplets or will oxidise onto the particles formed during combustion and is collectively known as sulphates.